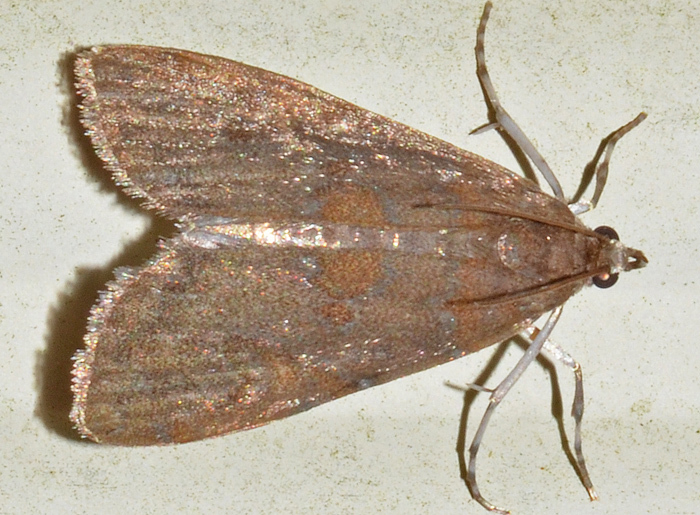 Elophila gyralis - Hodges#4751 (Waterlily Borer). Larvae of this moth feed on the leaves of waterlilies. More precisely, they bore into the stalk (petiole) that attaches the leaf blade to the stem. The adult is sexually dimorphic: females are usually unmarked orangish-yellow to dark brown, while males can have more intricate patterns and be grayish. The Waterlily Leafcutter is known to damage the invasive hygrophila and hydrilla. 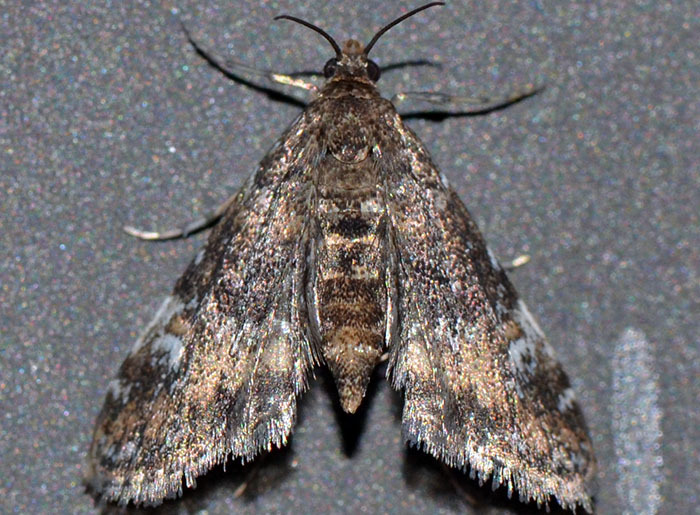 The UF link states: "The larvae are the stage that feeds on the plants and causes damage to the plant tissue. In addition to feeding, the larvae cut the leaves to prepare a leaf case for shelter. As the larvae develop, they cut new, progressively larger leaf cases. This action in itself can provide quite significant damage to the infested plant. In a field study, to compare the effect of herbivory on different aquatic plants, E. obliteralis was one of the three species that caused the most damage. When feeding the larvae remove chunks from the leaves, usually feeding on the basal or middle portions. This feeding often causes the leaves to break away from the stem. If the population density is high (...), the larvae will begin to feed on the stems, which can cause the entire plant to fragment." Elophila gyralis - Hodges#4751 (Waterlily Borer) ♂. ... and here's a male of E. gyralis. For more information, please see above. Elophila icciusalis - Hodges#4748 (Pondside Pyralid). 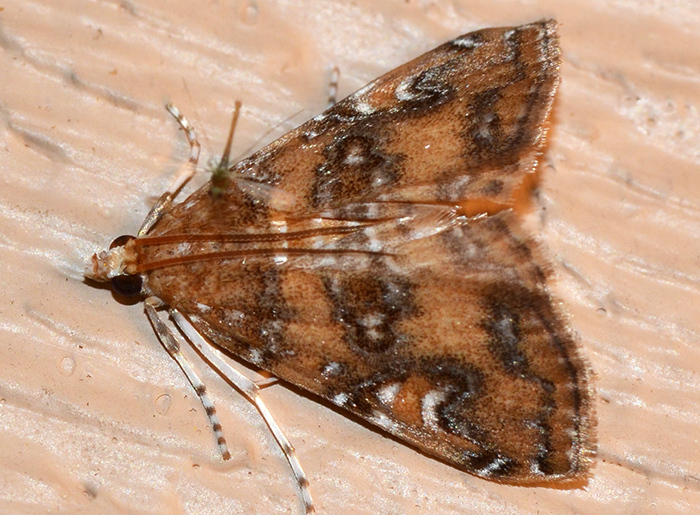 And another species in the genus Elophila: the Pondside Pyralid. 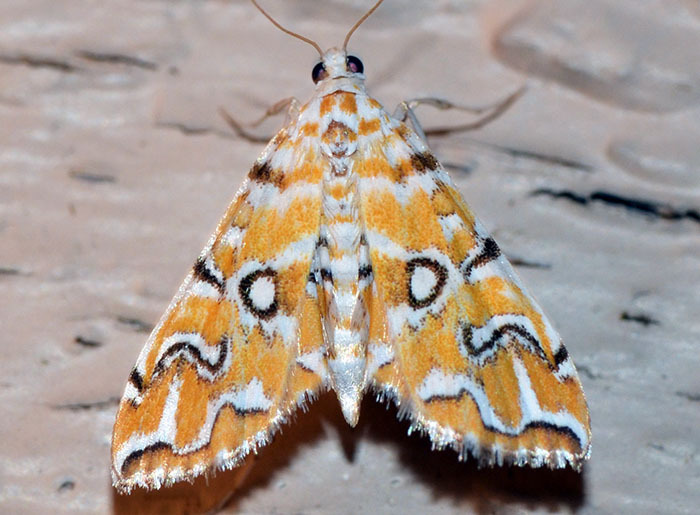 The larvae are aquatic and also the adult moths are found near this habitat. They are also attracted to light. Looking at other photos on the internet, I think this is a particularly beautiful specimen.